New details have come through from 2K in regards to the upcoming WWE 2K18 - MyCareer mode! 2K have dropped more details in regards to what we can expect from the MyCareer mode in WWE 2K18! This year, you’ll have two very different paths you can take en route to your own WrestleMania moment (note: you will be able to play past that WrestleMania moment; your story won’t end there). Going down the Company Man path means you’re all about helping the general managers (GMs) get what they want out of the roster on any given show. This involves conspiring with the GMs backstage, ambushing other WWE Superstars in the locker room or during their interviews and basically doing whatever it takes to maintain that GM’s power, both in the ring and backstage. The rewards are hefty, though! Continue helping the GM succeed, and you’ll gain access to awesome upgrades, such as the ability to orchestrate a run-in to help you win a match. You can also access Vince McMahon’s office to lobby for match card changes and title rematches. Being a Fan Favorite means you don’t play the whole company game and you’re all about putting on the best matches and promos. 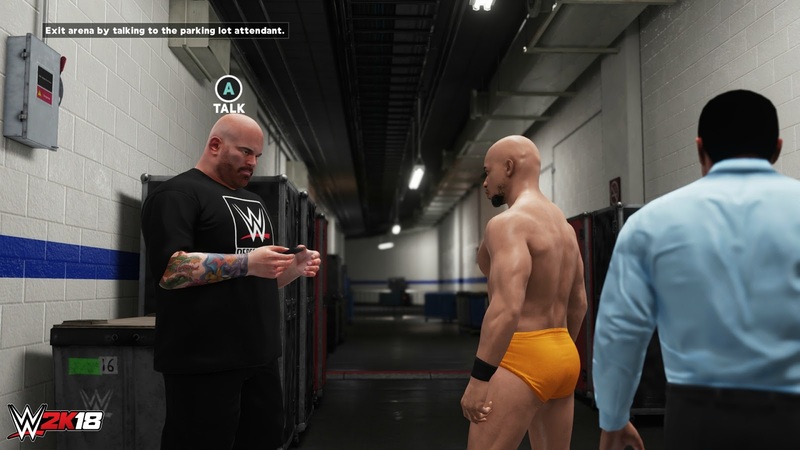 You have a locker room full of WWE Superstars and Legends backstage. This route involves earning their respect by taking on different match types – night-in and night-out. You’ll also have WWE Superstars test your in-ring aptitude and skills on the microphone, but if you succeed at this, you will earn the whole locker room’s respect – and with that comes some perks. WWE Legends are always backstage during events. If you earn their respect, they’ll start to give you in-ring bonuses for your matches and promos. If you become the complete package – the guy who can walk the walk and talk the talk like Stone Cold Steve Austin or John Cena – you’ll be able to have your own customized WWE Championship or Universal Championship. This honor is only given to the best of the best. In short, it’s ultimately your choice how your MyPLAYER’s road to WrestleMania will unfold. We definitely put a bunch of twists and turns to make it feel like it’s your own story, and we hope you’ll be surprised by a few of the WWE Superstars and events that will pop up along the way!